It's all gravy, baby. A soaked sandwich from Dip & Flip. There’s nothing glam about gravy but it sure hits the spot. Whether you’ve fond memories of thickening meat juices while tugging at your granny’s apron strings, or just pouring water onto a spoonful of Bisto, there’s a special place in the hearts of many when it comes to this savoury sauce. But gravy is branching out. Gravy is no longer satisfied with just bangers and mash or Yorkshire puddings. Here are the best places to get your fix in London. Dip & Flip burst onto the sandwich scene in 2013 with something completely different — roast beef sandwiches, burgers and patty melts that come soaked or with a bowl of gravy for dunking. They’re steaming along, and are just about to open their third site in Tooting (others are in Battersea and Wimbledon). The dip is a sandwich of thinly sliced roast meat which you can order dipped, double dipped, or soaked. 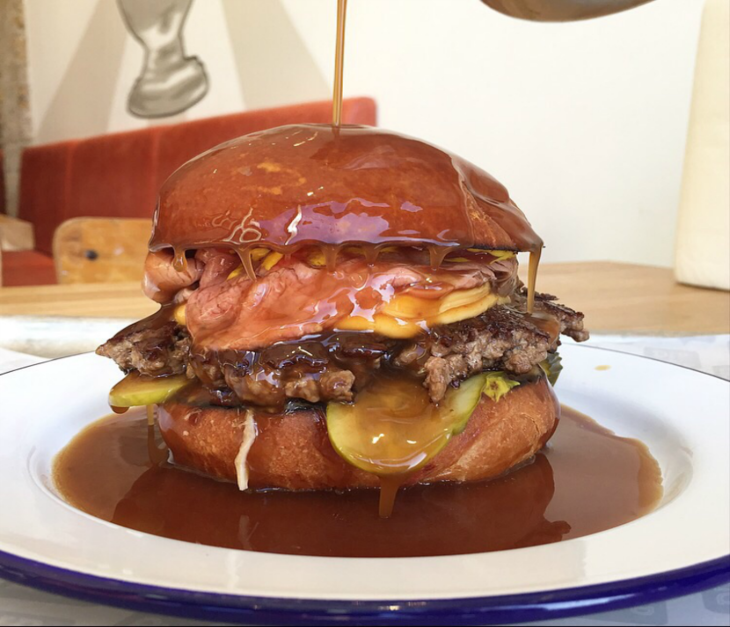 A sandwich soaked in gravy you say? Don’t knock it until you’ve tried it. The brown stuff is made in-house over three days using roasted beef and veal bones and it has great depth of flavour without being too thick and over-reduced. They get through 300 litres of it per shop, per week. The Pig and Butcher made it onto our map of the best roast dinners in London, with special mention for the gravy. Apparently, this is also three days in the making (like the gravy at Dip & Flip, above) during which time stock is gradually reduced until it's rich and thickened. Perfect for pouring all over those roasties. A bit leftfield, this one, but excellent. In fact, we’d go as far as saying this is one of the best meat sauces in London, full stop. The port and stilton sauce at Goodman steak houses is made with veal stock, then of course port, and Stilton. It’s thick, silky smooth and stealthy. Building relentlessly towards all consuming tastiness, this elixir, once experienced, is like a worm in the mind. A drug. An addiction. You’ll have to fork out for a steak to experience it, of course. No prizes for guessing what these guys are selling. 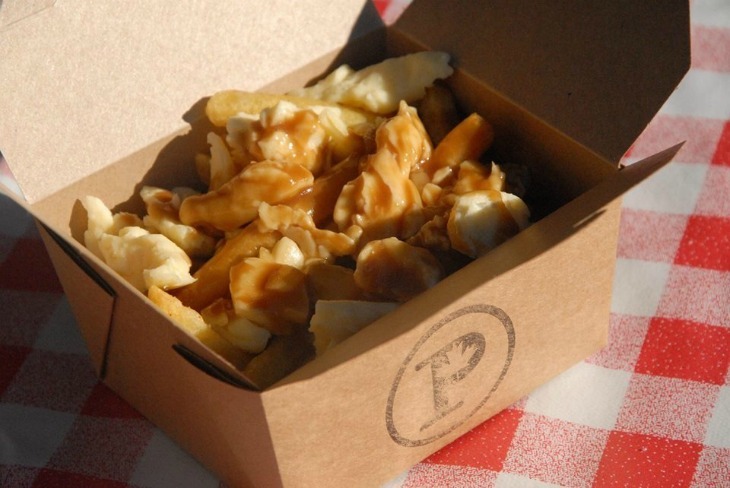 Poutine is a Canadian comfort food arrangement of chips, soft cheese curds and gravy. Chef and owner Paul Dunits points out that with only three ingredients “there’s nothing to hide behind” and so they all have to be top notch. The gravy is made from chicken stock, thickened with a roux to make a chicken velouté. It might be all fancy by name, but this is pure and simple. The silkiest sauce in town. Hawksmoor really do make some fantastic sandwiches, although be warned that you will need a lie down afterwards. Their French dip comes stuffed with short rib meat and then some cheese for good measure. On the side, a pot of very intense gravy. It’s tastes how you always imagine your own gravy will, but never does. We actually really struggled with this one, as there are so many places serving sausage and mash in London. For consistency though, it has to be Mother Mash. The mash is spot on (well, you’d hope so) and the gravy comes in four varieties including onion and ‘farmers’ (with bacon, red wine and mushrooms). Uncle Charlie's 'Boom Boom' cuisine. This Peckham street food star is a bit of a wild cat. Charlie can be found in Copeland Park serving his ‘Boom Boom’ cuisine, which is a huge hit with the locals. Enter through the Bussey Building from Rye Lane, listen for the sounds of reggae and follow the sweet smells until you find his stall as this guy makes some of the richest gravy in London. 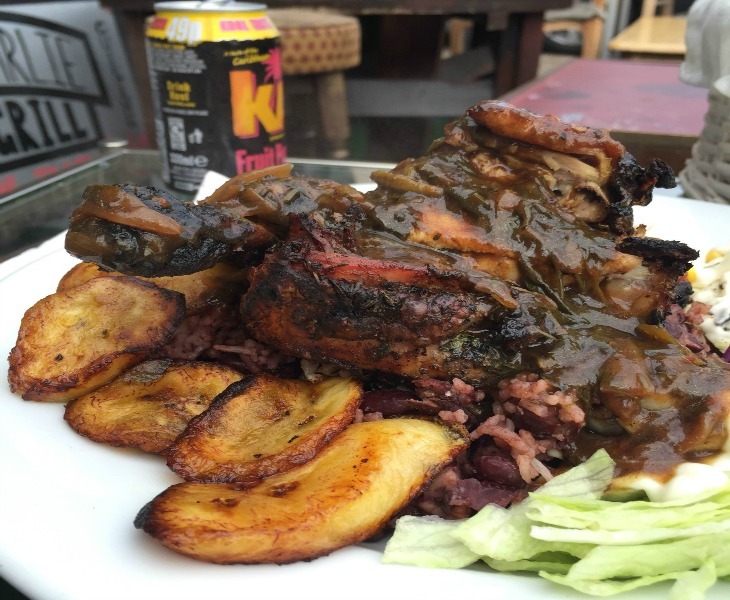 Packed with onions, and frankly, goodness knows what else, it’s sticky, sweet and good on just about anything, particularly a plate of his chicken, rice and plantains.